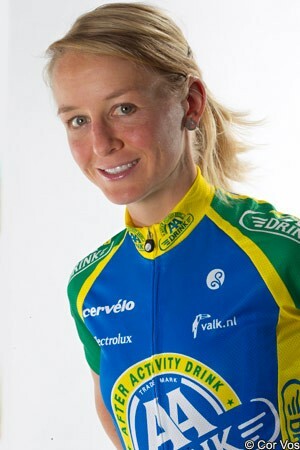 Emma Pooley has ended speculation about her immediate future by signing for the Bigla Cycling Team, making her the last big name from the now-defunct AA Drink-Leontien.nl team to have found a new home for 2013. The move is something of a step down for the former World time trial champion however, since the Swiss team will not be registered with the UCI, and so will not be eligible to ride World Cups or the big stage races like the Giro Donne. Much of Pooley’s role with the team will be to help develop its young Swiss riders though, who are making the step up to international level. "I am looking forward to the new challenge and will do my best to bring the youngsters on," said Pooley, who lives in the Swiss city of Zurich. Bigla was one of the biggest UCI Women’s teams between 2005 and 2009, boasting such riders as Swiss Nicole Brändli and Karin Thürig, Italian Noemi Cantele and Kazakh Zulfia Zabirova. Following the 2009 season though, the sponsor - which manufactures office furniture - stepped back from the international scene to concentrate on developing young Swiss riders. With no UCI status however, the team will be ineligible for races ranked higher than 1.2 or 2.2. This means that it will not be able to ride any World Cup races - of which Pooley has won six - or the Giro Donne, where the former British champion has finished second in the last two editions. Much of the team’s roster will be made up of those young Swiss riders and juniors, but Pooley will be joined by a number of more experienced riders. Austrian champion Andrea Graus, who rode for Bigla in 2006 and 2008-9, returns to the team from Vienne Futuroscope, along with former Swiss champion Emilie Aubry from Team GSD Gestion - who rode with Pooley at the Cervélo TestTeam in 2009/10 and with Marianne Vos at Nederland Bloeit in 2011. Former Luxembourg champion Nathalie Lamborelle also moves across from the Kleo Ladies Team. As it has done since its original founding in 2005, the team will ride BMC bikes, while clothing will be supplied by Italian company Parentini. Emma Pooley (GBr), Andrea Graus and Verena Eberhardt (both Aut), Nathalie Lamborelle (Lux), Isabelle Beckers (Bel), Katarina Hranaiova (Cze), Emilie Aubry, Désirée Ehrler, Martina Weiss, Sandra Weiss, Nicole Hanselmann, Larissa Brühwiler, Rita Imstepf, Caroline Baur and Stefanie Bochsler.